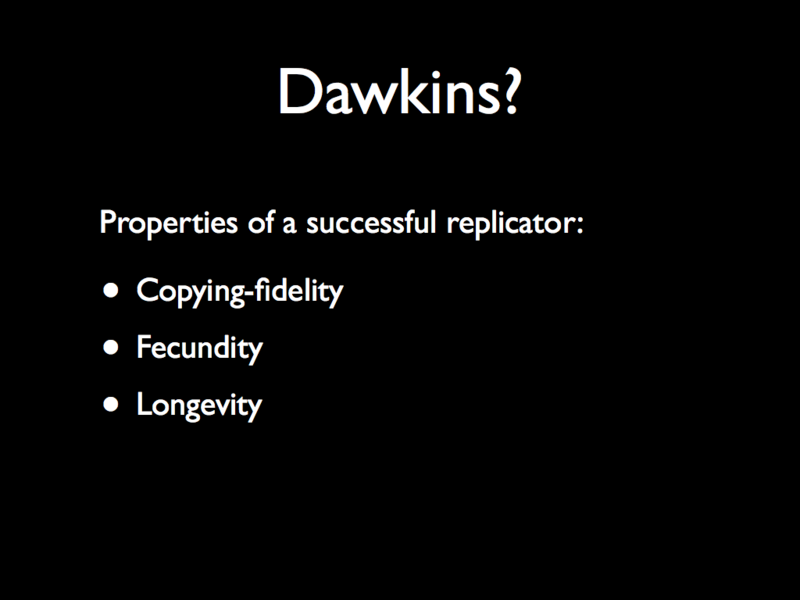 Dawkins lists three characteristics for any successful replicator; copying-fidelity, fecundity and longevity. Copying-fidelity is a measure of the faithfulness of a copy when compared to the original. The reasoning behind this parameter is that the more faithful a copy is, the more of its initial pattern will survive after several rounds of copying. Fecundity is a measure of the speed of copying. It is assumed that the higher this copying rate, the more this replicator will be able to spread. Longevity measures how long an instance is able to survive, where it is assumed that tougher instances will allow for more copies being made. The medium by which a macheme is communicated will influence how it’s copies come about and the efficiency of transmission, which affects the dynamics of replication. Macheme transmission over the internet has a higher copying-fidelity than meme communication through sound or word. Digitalization allows the transfer of information without loss, unlike the analog mechanisms of photocopying, filming or tape recording. So the first characteristic is filled. The bots on twitter can copy without any loss. Fecundity is also increased, since computers can produce thousands of copies of a message in very little time. Longevity is potentially larger than with memes, since information can be stored indefinitely on disks or in archives. Together, these three properties show that machemes can replicate very efficiently.